Get ready to enjoy each road trip with this Georgetown 5 Series 31L5 motorhome. You will be amazed at the beauty and attention to detail inside this model. Once you are parked you will find plenty of room to relax throughout the day between the four-person theater seating and the dream dinette. The super-sized dream dinette is not only the best place to enjoy your meals, but also a great place to play a card game or two. While you're relaxing in the theater seating, you can enjoy the cozy fireplace and also watch your favorite movie on the 40" LED TV. If you have a little desk work to do, then the passenger work station is sure to come in handy. A key feature in the kitchen is the 18 cu. ft. refrigerator where you can easily stock up and store your perishables! 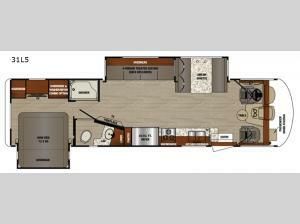 For comfort and style you will want a Forest River Georgetown 5 Series class A gas motorhome. Along the exterior there is a "Super Storage" rear cargo compartment, an outside shower, as well as a stylish fiberglass front cap with a lighted logo, LED accent lights, and an automotive bonded front windshield. As you step inside, be prepared to be wowed with all of the at-home convenient features such as the stainless steel three-burner cooktop with oven, the two LED TVs, and the King Jack™ digital TV antenna with a mount and built-in signal meter. In the cockpit there is a custom dash with ABS side consoles, drink holders, and a 110V outlet/USB. You will also enjoy the convenience of the MyRV touchscreen with wireless technology.